You feed before they feed. That’s the tagline for Fright Feast, one of the Evil Upgrade options available at Howl-O-Scream 2017 at Busch Gardens Tampa Bay. 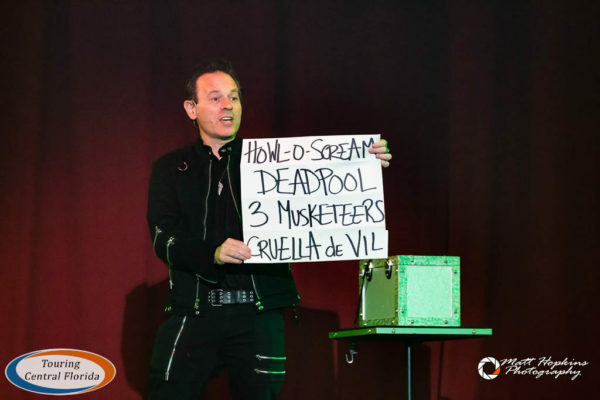 As an add-on to your Howl-O-Scream admission, Fright Feast gets you an all-you-can-eat meal, exclusive performance, and front of the line access to most of the haunted houses until 8:30 p.m. 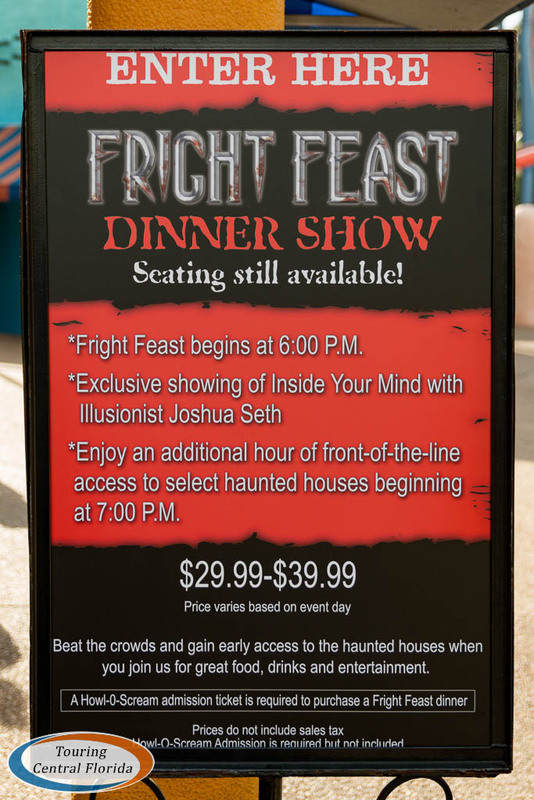 The price for Fright Feast ranges from $29.99 to $39.99. 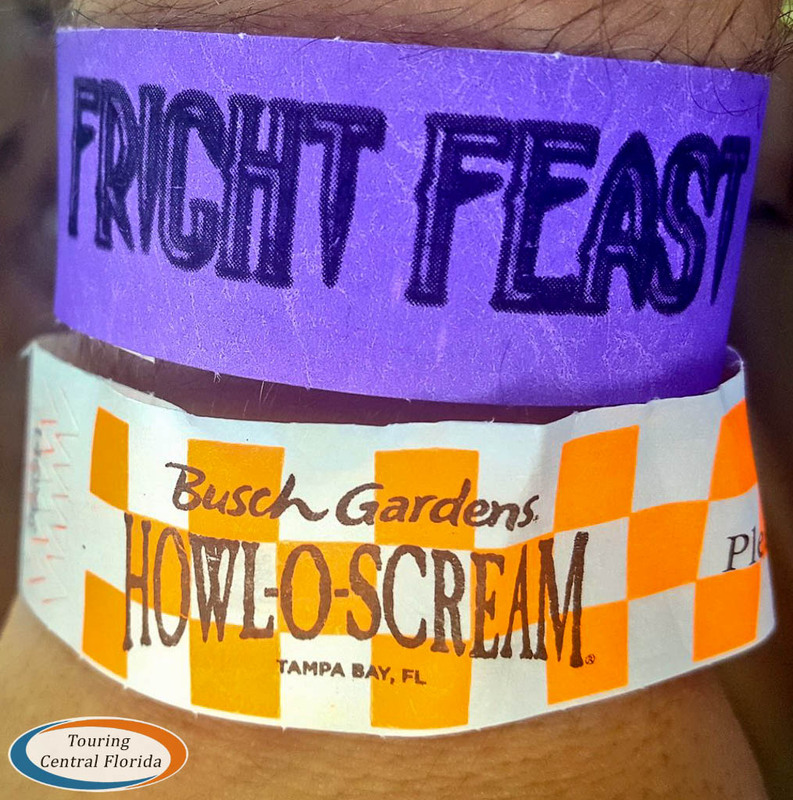 Thank you to Busch Gardens Tampa for recently giving us complimentary access to Fright Feast; all opinions in this article are our own. 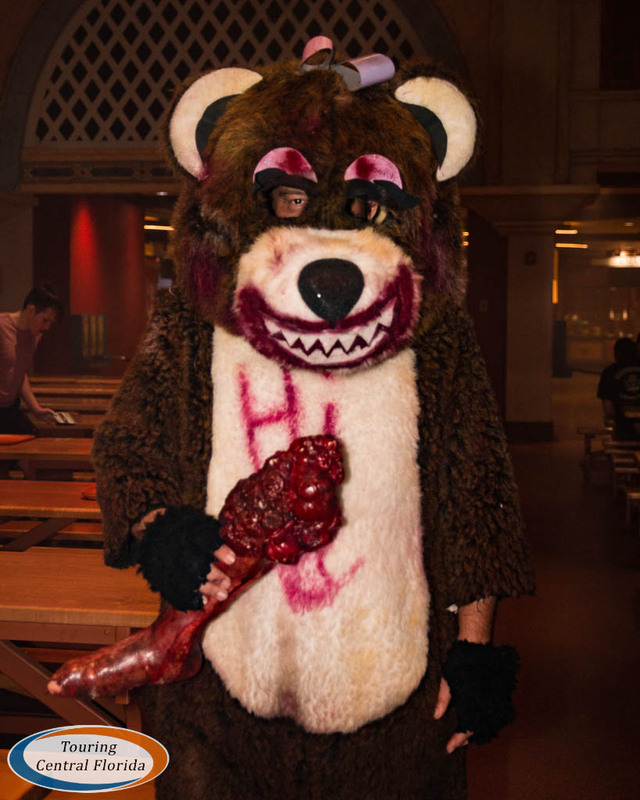 It’s best to reserve your spot for Fright Feast online or over the phone to make sure you can get in, as it does sell out on some nights. If they still have space available, however, you can buy in park. It starts right at 6 p.m., and you can check-in at Dragon Fire Grill to get your wristband before that. We picked up our wristbands just after 5 p.m. with no wait. I definitely recommend getting in line 15 to 30 minutes before the doors open at 6. This way your group can be some of the first to grab food & the perfect seats inside. 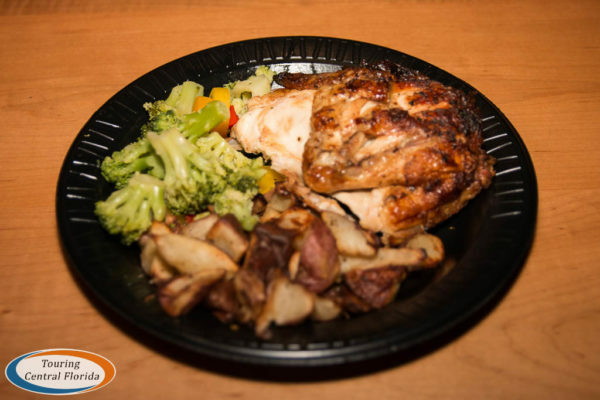 Held in Dragon Fire Grill, Fright Feast offers an all you care to enjoy meal featuring several pre-plated entrees, a number of sides and desserts, and free fountain drinks. Alcoholic beverages are available for purchase. 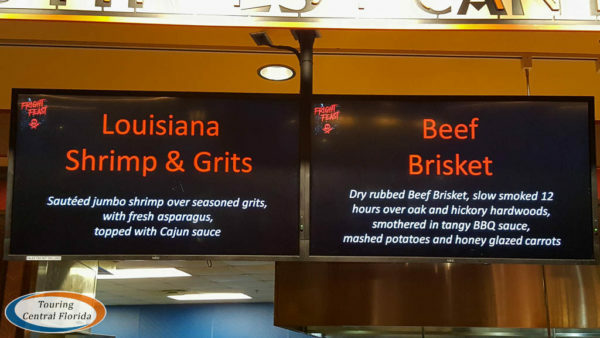 When we attended, the entrees were broken up into two serving lines, with Rotisserie Chicken and Chicken Alfredo to the left, and Louisiana Shrimp & Grits and Beef Brisket to the right. An small assortment of desserts were also located in both lines, with a larger selection plus additional sides available around the center island. 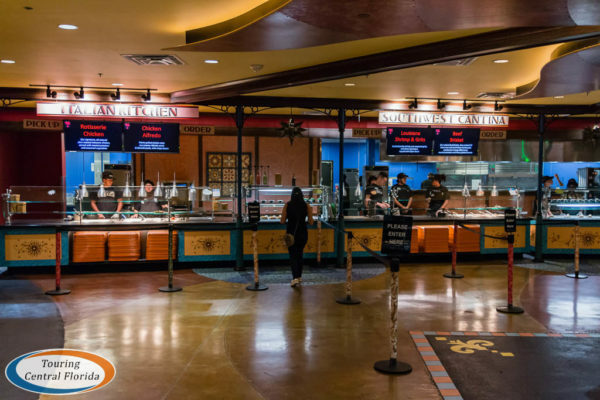 The food is what you expect from a theme park buffet – plentiful, filling, and decent in taste. 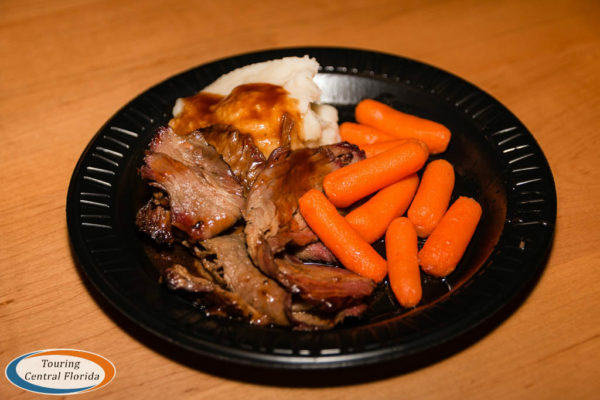 The Beef Brisket with mashed potatoes was the best in our opinion – it holds up well being mass produced for the event. 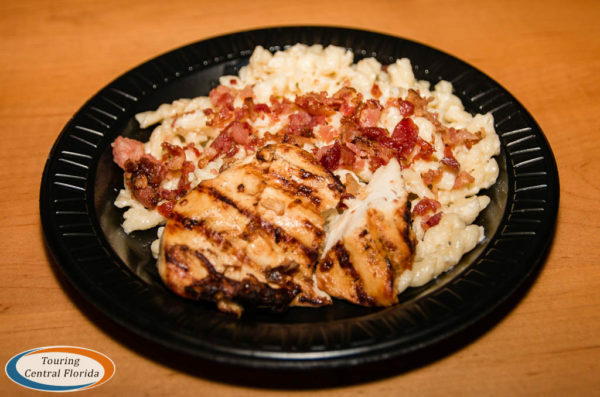 Similarly good was the Chicken Alfredo with bacon, though it could have used more sauce. 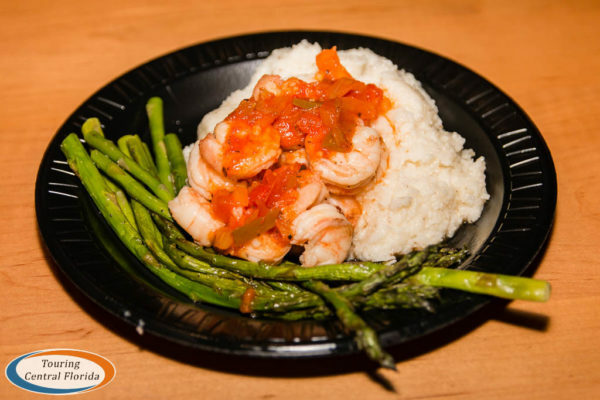 The Louisiana Shrimp was also tasty – just a slight kick of spicy, but not especially hot. 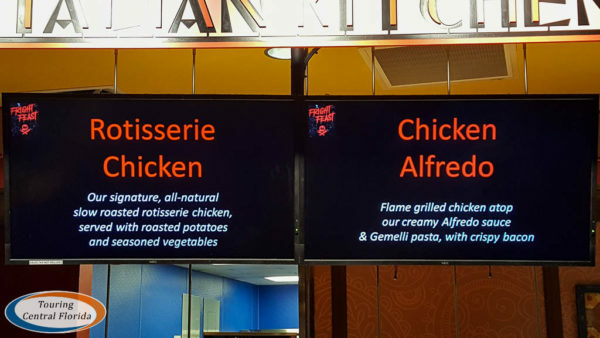 We were disappointed with the Rotisserie Chicken – the flavor was fine, but it was quite dry. 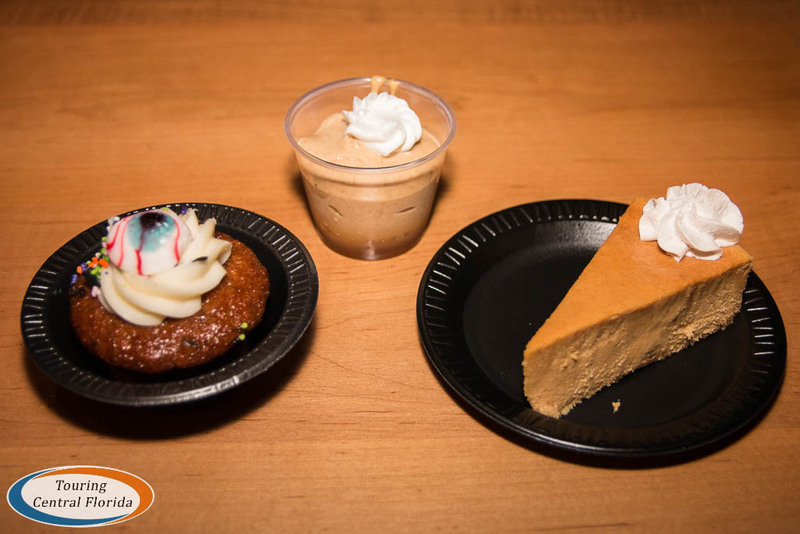 There are a number of desserts available, including the popular Pumpkin Cheesecake, a thick Pumpkin Spice Pudding, and a couple different types of cupcakes. We also sampled a tasty warm apple cobbler. In addition to the options described above, we also saw side salads, chips & salsa, and rolls & butter available. Since you are welcome to grab as much as you like and return to the buffet as often as you want, if you leave hungry from Fright Feast, you definitely did it wrong. Keep an eye out for uninvited guests while you dine. We got a visit from some of the “Huggables” gang, who managed to sneak up on some guests and give them a pretty good startle. At 6:30 is the exclusive showing of Inside Your Mind, featuring mentalist Joshua Seth. (Fiends moved back to Stanleyville Theater this season.) Seth performs a few feats that will leave you scratching your head wondering how he did that. 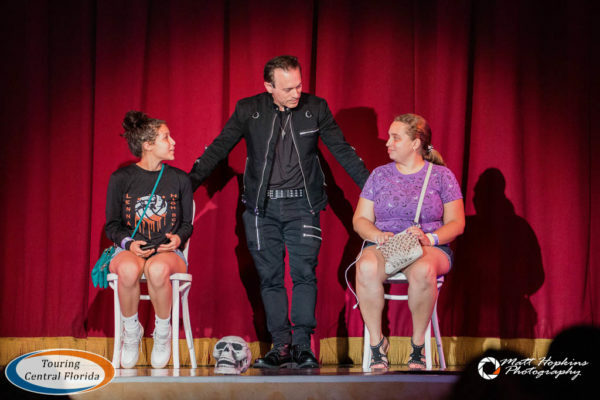 The show is interactive, so it helps to have a larger, engaged audience. On the night we attended, it was rather quiet, so the show didn’t have quite the same impact as it did when we saw it on opening night. It’s worth noting this performance is a bit shorter than the rest of the shows later in the evening. Dinner service wraps up at 7 p.m., and then it’s time to head out into the park and start hitting houses! Officially, Howl-O-Scream starts at 7:30, but the houses typically start opening a bit before that. Your Fright Feast Wristband gets you front of the line access to all of the houses except Zombie Containment Unit 15 until 8:30 p.m. Most Fright Feast guests head across Pantopia and queue up for Demented Dimensions, so it may be better to head to one of the other houses first, then loop back. Fright Feast remains the best Evil Upgrade option in terms of value. You get a hearty meal and exclusive show before the event even begins. The front of the line access until 8:30 p.m. then allows you to hit at least a couple of houses before the crowds move in, leaving plenty of time to hit the remaining houses, catch a performance of Fiends, and enjoy the rest Howl-O-Scream at Busch Gardens Tampa has to offer. Don’t miss our look at Howl-O-Scream 2017 Opening Night, and our huge preview article detailing the entire event! Join in the conversation on social media by using #HowlOScream, #NowhereToHide, and #HOS17. For the latest on Howl-O-Scream 2017 at Busch Gardens Tampa and other theme parks, attractions, dining venues and more across the region, be sure to follow Touring Central Florida on twitter @TourCentralFL & @androckb, and give our facebook page a like. I bet hеs PERFECT at it!? Laughed Larry.